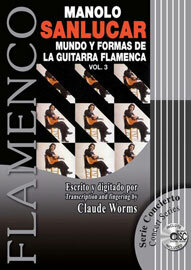 The decision to publish the transcription of The World of the Flamenco Guitar and its Forms is the decision to disseminate a major work. Now, all those who wish to learn about and explore this gem of Spanish music that has laid unnoticed for too long are able to do so. Manolo Sanlucar's album trilogy is not only apt for flamenco or Spanish musicians but for guitarists worldwide since it constitutes the greatest of the many master classes this maestro has given in his long career. The original, authentic and unmistakably flamenco music in this work has stood the test of time, transcending fashion and trends. Immersing oneself in this magical document is to cross the erstwhile unreachable threshold of one of the most dazzling chapters in the history of the flamenco guitar.